Complete Packaging Station - every mail center should have a packaging center for small packages. Adjustable shelves to keep shipping boxes and packing tape at your finger tips. • 83" x 33" laminated work surface with T molded plastic edging. 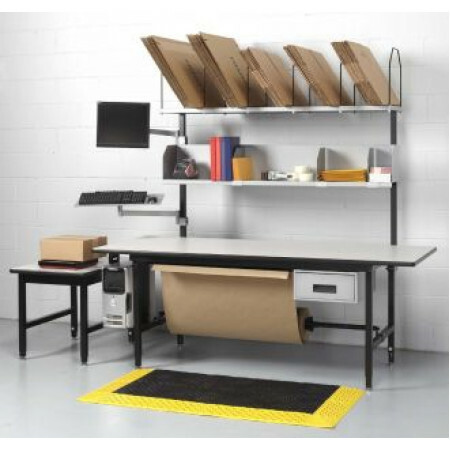 • Large work table is adjustable from 29" to 36" for the perfect working height. • Scale table is 23-1/2' x 33" and adjustable from 25" to 32"H.
• Includes the paper roll holder and under table top paper cutter. • Carton shelf is 15-1/2" D x 83- 3/4"W each wire support is 16" H.
• Middle document shelf is 83" x 9" x 9-1/2"H and perfect for packing supplies, envelopes and informational binders. • Flat screen swivel bracket for easy viewing and key board / mouse shelf 24" x 8" also the CPU side bracket to hold your computer.